Given Winston Churchill’s fear that the U-Boat menace was the one threat which he feared the most during the Second World War, his allowing “Bomber” Harris to divert Bomber Command into sending thousand bomber raids over Germany instead of first concentrating on winning the Battle of the Atlantic is incomprehensible. One of the stalwarts of Coastal Command, the Short Sunderland four-engined long-range flying boat, was itself a victim of this kind of muddled thinking and misallocation of resources. Inspired by the commercial Short flying boats which linked the far-flung parts of the British Empire, the Sunderland was originally designed to carry a powerful 37mm calibre automatic cannon in the nose, for an anti-shipping role. Using armour-piercing or semi-armour-piercing rounds this cannon, the C.O.W. Gun, so named after its originators, the Coventry Ordnance Works, could have been a devastating weapon against surfaced U-Boats. When the Air Ministry, in its wisdom, decided to drop the C.O.W. Gun and instead install a powered tail turret with four short-range .303 Browning machine guns, the design characteristics of the Sunderland were completely upset. To maintain the correct centre of gravity, the wings had to be set back in a swept configuration. As a quick fix the original motor mounts were left unchanged, meaning that each motor exerted its thrust at a slight angle to the line of flight, thereby wasting a fraction of its power. Even worse, the forward-firing armament was reduced to just a single .303 calibre Vickers K Gas-Operated machine gun in a nose turret. This puny armament was supposed to clear the decks of a surfaced U-Boat firing back with 20mm and later 37mm automatic cannon, which far outranged the small calibre .303 round. As for the 37mm C.O.W. Gun, the design was purchased by Vickers, who continued to produce it as the Vickers ‘S’ in 40mm calibre, used during the Second World War as an anti-tank weapon fitted under the wings of Hawker Hurricane Mk IID aircraft in North Africa, with mixed success. 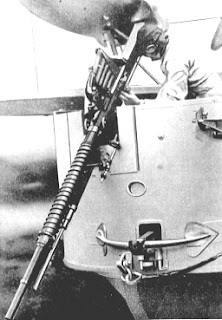 Ironically, the best anti-submarine gun turned out to be the automatic 6-pounder (57mm) Molins Gun, fitted in only a handful of Mosquitos. Its use in Sunderlands was never considered. Finally, the heroic Sunderland crews, flying 12-hour patrols over the sea, were expected to come home on the power of second-hand motors, which had already seen action in Bomber Command aircraft over Germany. After reconditioning, the Bristol motors were passed as fit for future service, but many parts must have been subject to metal fatigue. Again, being an earlier design of motor, their propeller feathering system contained not enough oil to correctly carry out this function, leading sometimes to the loss of an entire motor or at best a non-feathered dead prop causing extra drag on an aircraft hundreds of miles out at sea.